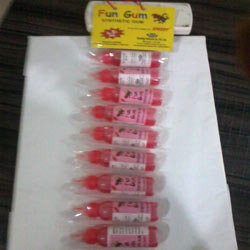 Backed by the sound experience of the industry, we are also involved in manufacturing and supplying Synthetic Gum. These products are prepared under the strict supervision of experienced professionals, and high grade ingredient procured form the authorized vendors of the industry. A team of quality analysts test these products on various parameters of quality, before the final delivery. Acknowledged for excellent bonding strength, water resistance and longer shelf life, these products are highly appreciated and demanded by the clients across the region. 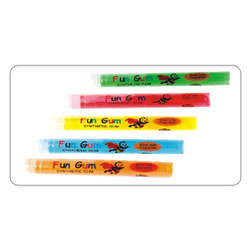 Innovation is our forte and we strives to develop and offer pristine assortment of Fun Gum. The range of adhesive we are offering is prepared in accordance with the norms and guidelines already set by the industry. These products are highly appreciated and demanded by the clients owing to their attributes like remarkable bonding strength, longer shelf life, perfumed, quick dry and high viscosity. 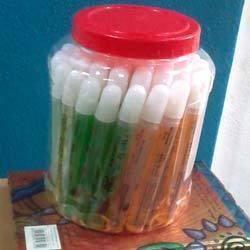 Customers can avail these adhesives in different size of packings as per their requirement and at reasonable market prices. 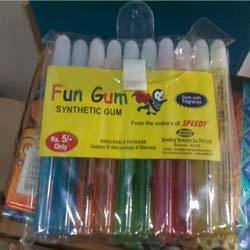 We are counted among the distinguished organizations, involved in manufacturing and supplying premium quality range of Synthetic Gum. These products are prepared under the guidance of diligent quality experts, following established quality norms and standards. With an aim to prepare quality range of products, our professionals make use of quality-tested ingredient obtained from the authentic vendors of the market. Offered range of adhesive is extensively used for bonding wood, plywood, laminates, veneers, particle boards and many other material. We offer these adhesives in packs of different size and at feasible market price. Looking for Synthetic Gum ?